This book presents an academically rigorous yet practical guide to efforts to understand how knowledge, policy and power interact to promote or prevent change. 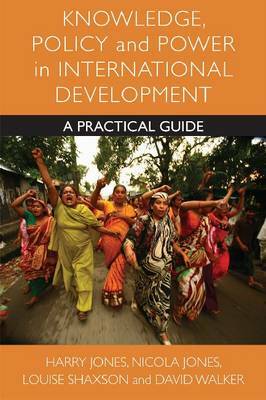 It offers a power analysis perspective on the knowledge-policy process, illustrated with rich empirical examples from the field of international development, combined with practical guidance on the implications of such an approach. It provides ways to identify and address problems that have hampered previous attempts to improve the space between knowledge and policy; such as difficulties in analysing political context, persistent asymmetric relationships between actors, ignorance of the contributions of different types of knowledge, and misconceptions of the roles played by intermediary organisations. Most importantly, the book gives readers the ability to develop strategies for negotiating the complexity of the knowledge-policy interface more effectively, so as to contribute to policy dialogues, influence policy change, and implement policies and programmes more effectively. The authors focus on the dynamics of the knowledge-policy interface in international development; offering novel theoretical insights and methodological approaches that are applicable to a broader array of policy arenas and their audiences, including academics, practitioners and students.